I CALL THIS KONKAN GRANOLA BECAUSE IT REMINDS ME OF TILGUL. THIS GRANOLA IS MADE WITH NATURAL SWEETENERS AND NO ADDED OIL. IN A SMALL DRY SKILLET TOAST THE COCONUT ON A MEDIUM FLAME UNTIL GOLDEN AND CRISP. RESERVE ON A PLATE. TOAST THE CHAROLI AND CASHEWS IN THE SAME SKILLET UNTIL GOLDEN. TOAST THE SESAME SEEDS IN THE SAME PAN UNTL GOLDEN AND COMBINE WITH THE COCONUT. AFTER ALL THE INGREDIENTS HAVE COOLED COMBINE REMAINING PUFFED RICE WITH THE SESAME, CHAROLI, CASHEWS, COCONUT AND THE DATES. STIR TOGETHER WELL TO EVENLY DISTRIBUTE THE INGREDIENTS. POUR INTO A CLEAN DRY CONTAINER AND KEEP REFRIGERATED. GREAT AS A SNACK, YUMMY WITH YOGURT, FRUIT AND PORRIDGE. This recipe uses easily available ingredients that you can buy almost anywhere in India and tastes delicious. It's also exceedingly simple to make. But if you don't like coconut this isn't for you. 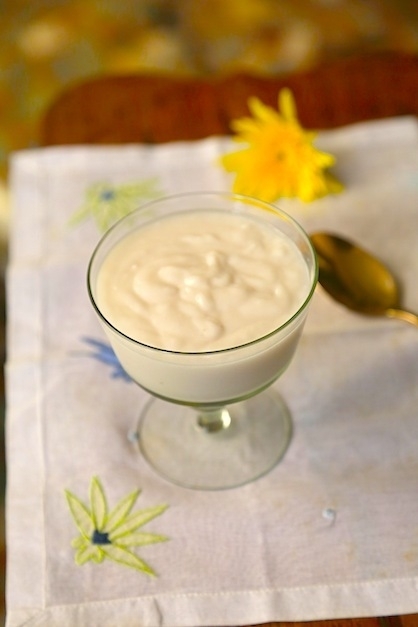 This yogurt produces a texture that's a bit like homemade yogurt. Ive used this yogurt to make curries as well and it also lends richness and body to them in a way that regular milk based yogurt does. Ask your nariyal paani wallah to give you the meat of the coconut prepared and probiotic tablets are available at almost any chemist. Best to prepare this recipe late the previous night. Pick any brown fibers off the white meat. Place the meat and lime juice in a blender and blend until smooth. Add 2 tbsp coconut water and blend again in the until smooth. Pour into a small mixing bowl. Break open the capsules of probiotic supplements and stir into the tender coconut puree. Add some more coconut water. The mixture should be soft and a bit oozy. It will grow in size. It will also firm up once chilled. Cover with a damp cheesecloth or a clean wet cotton kitchen towel and let it sit in a dark, cool room for 8 hours. if its very hot and humid I would reduce this to 5- hours. Then cover and chill for a few hours. Stir and scoop into bowls. 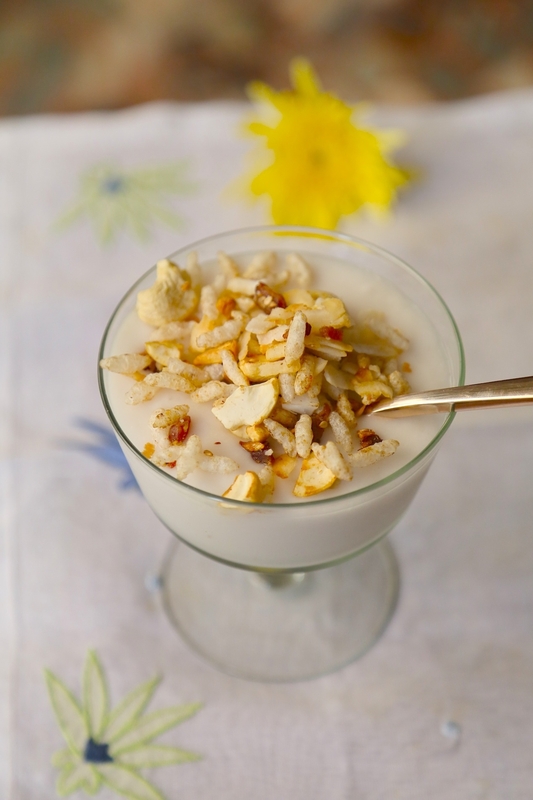 This tastes lovely as is, with granola or fresh fruit, honey and almonds. Try it with my gluten free Konkan Granola. For a soft and fluffy idli use fresh ingredients and eat them as soon as possible. 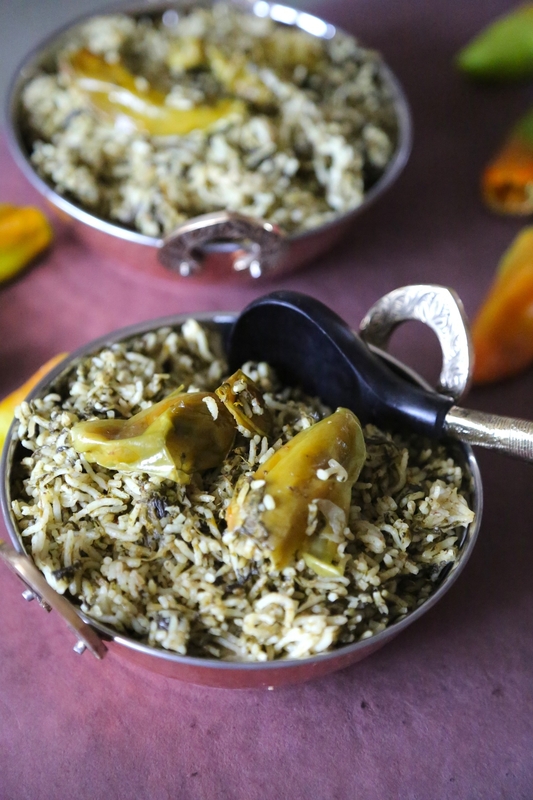 In a dry skillet over medium flame toast the green curry leaves until they dry and lose water. They will crisp and begin to break. Cool on a plate. In the same skillet dry toast the sesame seeds until lightly golden. Combine with the curry leaves on a plate and cool. Heat 1.5 teaspoons of ghee or oil in a small skillet on medium flame. Toast urad and channa dals together 2-3 minutes until golden brown. Switch off flame, pour dals into a plate and cool. Then grind to a fine powder. Heat remaining ghee or oil in the same skillet on medium heat and roast red chillies. A asafetida and saute 1 minute. Remove from fire, pour into a plate and cool. Grind the curry leaves, sesame and red chillies to a fine slightly clumpy powder. Add the powdered lentils, one teaspoon of salt and continue to grind until you have a smooth powder. Taste for salt. Cool and bottle in a dry airtight jar. Keep refrigerated in humid weather. Wash the rice and the urad dal separately. Soak each in a bowl of water for 6 hours. The water should rise above the rice and urad lentil. Grind rice in a food processor or rice grinder until smooth. Add water in very small quantities to facilitate grinding. If you add too much water the grains will slip between the blades and you will have a gritty batter. This process would take anything between 10-15 minutes depending on the quality of your grinder. Grind in stops and starts to prevent your motor from overheating. Repeat the same process with the urad dal. Grind in batches until smooth. Add water a few tablespoons at a time. When you have a smooth paste combine with the rice batter and grind again so they are both well incorporated. Place the smooth batter in an extra large and covered container in a slightly warm corner of the kitchen and allow the batter to double in size for 8-9 hours. Stir in the salt and mix gently. Preheat your steamer. Idlis cook better when the steamer is already hot. Set the water to boil if you are using a pressure cooker. Lightly oil the mini idli stands. Pour the idli batter a teaspoon at a time into the mini idli stands. Cover with a slightly damp muslin cloth. Steam as per directions. For smaller idlis possibly 10-12 minutes. Remove stands from the steamer and gently pry loose the idlis. Brush with ghee or oil if desired. 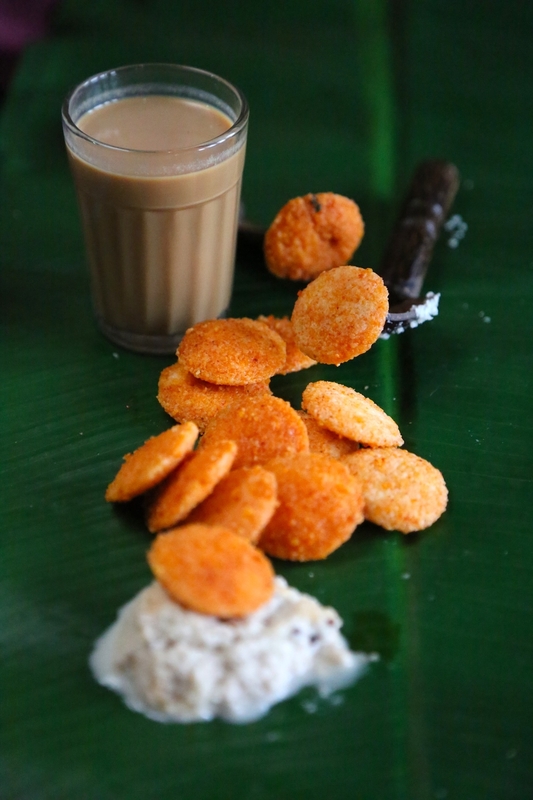 Sprinkle with podi and serve with chutney and or sambhar. 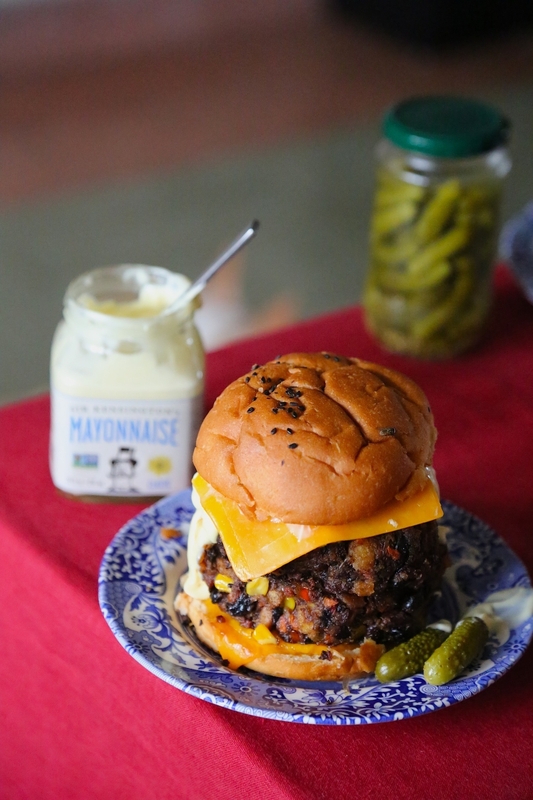 You can use black beans or pinto beans for these burgers. Cook the beans until they hold their shape but are tender and melt in the mouth. If you refrigerate the patties, microwave them for 30-45 seconds before you fry them to ensure they are warm all the way through when you. Heat oil in large pot on medium heat and add onions, both bell peppers and celery. Saute 1-2 minutes. Add corn and carrots and saute 1-2 minutes. Add garlic and saute another minute. Stir in black beans and saute 3-4 minutes. Cook until beans are very soft and mixture is dry. Use a potato masher to mash the ingredients lightly just enough to incorporate them. Switch off flame. Add potato, chilli sauce, cumin and cinnamon and mix well. Season with salt and adjust to taste. When mixture cools stir in coriander leaves. Divide into 6 portions and form patties. Dip generously in breadcrumbs pressing down lightly to insure the entire patty is coated. Fry on medium heat in a non stick pan in vegetable oil until golden on all sides. Serve with buns and optional garnishes. HEAT 2 TABLESPOONS OIL IN A NON-STICK SKILLET ON MEDIUM HEAT AND FRY SALMON FILLETS OR TOFU UNTIL GOLDEN ON ALL SIDES AND FULLY COOKED. CUT SALMON INTO SMALLER PIECES ABOUT 2 INCH CUBES. RESERVE. MIX TOGETHER ALL INGREDIENTS FOR THE DRESSING UNTIL SUGAR DISSOLVES. SEASON WITH SALT AND PEPPER. ADJUST SWEET AND SALT TO TASTE. 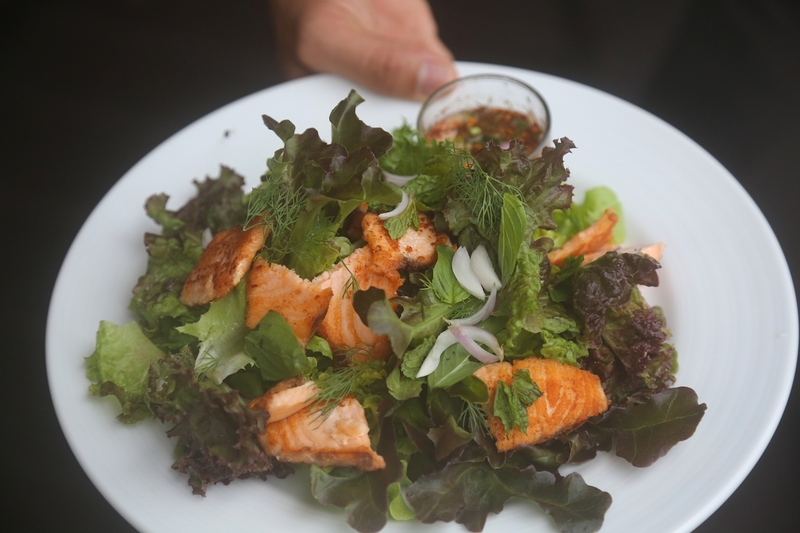 YOU CAN PREPARE THIS AS A SINGLE SALAD BUT IT SHOULD BE SERVED AS SOON AS ITS DRESSED. 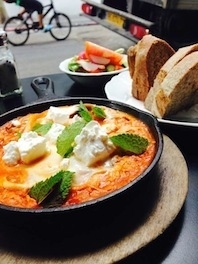 Shakshouka is made differently in Israel, Turkey, Egypt but is believed to be of Tunisian origin. The word is a derived in part from both Arabic and Hebrew and means a ‘ragout’ and ‘shaken’. In Israel the eggs are often left whole in the tomato sauce while in Turkey where the dish is also called Menemen, the eggs are scrambled in. This dish can be found in many forms in different cultures- take the Parsi classic Sali Pe Eeda or the Spanish Pisto, tomato sauce with fried eggs. While Shakshuka is always slow cooked eggs in a thick tomato sauce it can be spiced with various ingredients for a sweet and or spicy flavor; cumin, caraway, Harissa, cayenne, vinegar, honey are used variously. Take your cue from this- make it the way you like it. Shakshuka is always served with bread to sop up the gravy. Greens and herbs like swiss chard, kale, mint, parsely are thrown in to bulk up the dish. These eggs can be prepared on the stove top or in an oven like eoufs en cocotte individually or just slap the entire cast iron pan under the broiler like I do. I also recommend sprinkling the top with some soft, fresh Feta for a luxurious Sunday breakfast. A soft ricotta or strained cottage cheese will do fine. Heat oil in a skillet over medium heat. Add onion, bell peppers and cook 2 minutes then add tomatoes and sauté 1-2 minutes. •	Stir in tomato sauce, harissa, or whichever chilie you prefer, and cook about 30 seconds. •	Reduce heat to low and cook, stirring occasionally, until thickened and excess water evaporates. •	Add salt and sugar for taste. Check for spiciness. •	Stir in half of the parsley or herb of your choice, break the eggs over the tomatoes. Cover and continue to cook for about 3 minutes. Top with feta, cover and cook until eggs have set to your liking. Sprinkle remaining herbs, season with freshly ground black pepper and serve immediately with pita bread or baguette in the skillet. HEAT OIL ON MEDIUM FLAME IN A LARGE POT. ADD CINNAMON STICK, BLACK PEPPERCORNS AND BAY LEAF AND SAUTE 1 MINUTE. ADD CUMIN SEEDS AND COOK UNTIL GOLDEN AND FRAGRANT ABOUT 1 MINUTE. ADD ONIONS AND SAUTE 3-4 MINUTES UNTIL SOFT. ADD GARLIC AND GINGER PASTE AND SAUTE 2-3 MINUTES STIRRING TO PREVENT BURNING. ADD TOMATOES AND RED CHILLI POWDER AND CONTINUE TO COOK UNTIL TOMATOES ARE PULPY AND OIL LEAVES THE SIDES OF THE MASALA ABOUT 3-4 MINUTES. STIR TO PREVENT MASALA FROM STICKING TO THE BOTTOM OF THE PAN. ADD FENUGREEK AND SPINACH AND COOK 5-6 MINUTES UNTIL LEAVES HAVE WILTED AND LOST SOME OF THEIR WATER. ADD DRAINED RICE AND TOSS IN SPICES GENTLY SO AS NOT TO BREAK THE GRAINS. STIR IN THE GREEN CHILLIES. ADD 4.5 CUPS BOILING HOT WATER AND 2 TEASPOONS OF SALT. STIR, COVER AND COOK ON A SMALL FLAME UNTIL RICE IS FLUFFY. YOU CAN ALSO POUR THIS MIXTURE INTO A PRESSURE COOKER. YOU WILL NEED 3.5 CUPS OF WATER FOR A PRESSURE COOKER. ONCE RICE LOOKS LIKE ITS ALMOST DONE SWITCH OFF FLAME UNDER PRESSURE COOKER OR COOKING POT AND ALLOW RICE TO COOK IN ITS OWN HEAT. 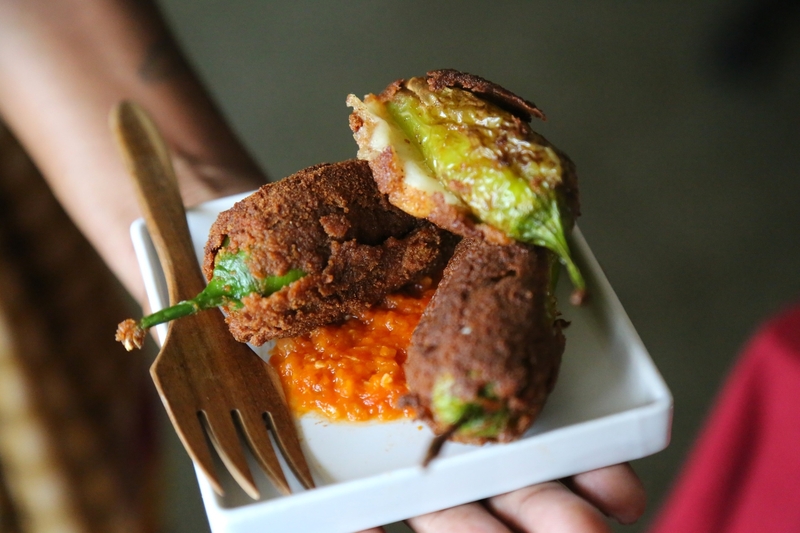 Stuffed peppers is something Indians are familiar with, be it Bharwa Hari Mirch, besan and coconut stuffed green chillies or paneer stuffed Capsicum. For this classic and much loved Mexican dish use Indian stuffing chillies if Poblanos aren't available. I've used Goa chillies successfully but you can also use Bhavnagiri. Both are mildly spicy, large with a lovely green color. If you want to make a meal of Chilles Rellanos make extra tomato sauce and serve with a portion of boiled rice. The traditional recipe uses eggs but if you are vegetarian use plain rice flour. Heat vegetable oil and saute onions on a medium flame until soft. Add garlic cloves and saute one minute. Add tomatoes, sugar, cinnamon and black pepper and cook sauce on a medium flame in a cooking pot about 50 minutes. Allow sauce to thicken. Season with salt. Reserve. While sauce cooks use a sharp knife to cut a small slit into each chillie. Ensure you only cut into one side and leave the rest of the pepper intact. Cut from one end to the other no more than 1/2-3/4 inch so the ends are sealed. On an open flame lightly char each pepper on all sides. Goa chillies are a little thicker and spicier than Poblanos. Flaming them softens the flesh and reduces the spiciness. the smoky flavor is an added bonus! Cool completely. Gently, using a small spoon remove any seeds. Stuff with cheese and close the sides of the chillies. Cover and reserve. Beat whites to stiff peaks. Beat in yolks 2 at a time until well incorporated. Beat in salt and 1 tablespoon of flour until well mixed. Don't over beat. Dip stuffed chillies into egg white preparation, then roll in crumbs. Repeat this process again, twice for each pepper. For pure vegetarians dip the chillie in rice flour several times and fry to a crisp. Heat 2 inches of oil in a skillet. You need enough oil so it just covers each chillie. This way the top cooks as well as the bottom and seals the slit chillie. This prevents leakage when the chillie is turned over in hot oil. Fry on both sides in 2 inches of hot oil (heated to 350F) until golden and crisp. Drain in a sieve over old newspapers. Once all chillies have cooled about 5-7 minutes prepare a serving plate with tomato sauce at the bottom. Place the chillies over the sauce. Garnish with coriander leaves if you like. Serve warm. To reheat the chillies, bake in a preheated oven for 5-6 minutes at 400F. Also called Arancini di Riso these fried rice balls made with Arborio, a short, fat grained Italian rice that is chewy and doesn't breakdown easily. It's available at most specialty stores and online. 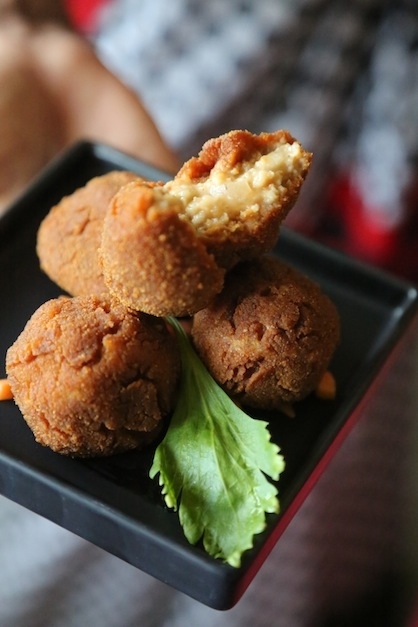 Arancini are delicious as a snack or appetizer. You can omit the cheese in the center if you prefer. Boil broth and oregano in a large saucepan. When broth reaches a boil remove one cup of broth and pour over the dried mushrooms. Keep the remaining broth on a very low flame. When mushrooms soften chop them up and reserve along with any extra liquid. Melt the butter in a heavy large saucepan over medium flame. Add olive oil and butter. Saute onions until tender, about 8-9 minutes. Add white mushrooms and garlic. Saute until the mushrooms are tender and dry, about 4 minutes. Stir in the rice and saute for a few minutes. Add the wine. Cook 2 minutes and add dried chopped mushrooms and their liquid. Then add 1 cup of hot oregano broth, stirring often, about 2 minutes. Continue adding more broth using a ladle and stirring often, about 20 minutes until creamy. Switch off flame. Cool 20 minutes. Add parmesan and mix well. Cool and then cover and refrigerate for 2 hours. Remove risotto from the refrigerator, add 1/2 cup breadcrumbs and mix well. Wet your palms, then roll risotto into small 1.25 balls. Set on a tray and keep covered. Take each ball and place in the center of your palm. Flatten gently and place a piece of mozzarella in the center. Then close the ball again so the cheese is in the center and fully covered. Return balls to the tray and keep covered. Pour 3 inches of vegetable oil in a heavy large saucepan and heat on medium flame. Place the remaining breadcrumbs in a medium bowl and the beaten eggs in another. Roll the balls egg and then in breadcrumbs. Repeat twice so balls are fully coated. Fry one ball first to ensure oil is hot enough. When golden brown drain and taste test to ensure proper seasoning. Fry remaining rice balls 4-6 at a time until golden brown. Using a slotted spoon, transfer the rice balls to paper towels and allow them to drain. Let rest 2 minutes. Serve hot with parsley garnish. HEAT 7 TABLESPOONS SESAME OIL ON MEDIUM HEAT IN A NON STICK SKILLET. ADD BELL PEPPERS AND SAUTE 2-3 MINUTES UNTIL THEY SOFTEN. ADD GARLIC AND SAUTE 1 MINUTE. ADD LEMON GRASS, RICE WINE VINEGAR, SOY SAUCE, TOASTED SESAME AND SWEET CHILLIE SAUCE AND STIR TOGETHER 30 SECONDS. SWITCH OFF FLAME AND SEASON SAUCE WITH SALT TO TASTE. POUR OVER SOBA NOODLES AND TOSS. SEASON WITH SALT AND PEPPER IF REQUIRED. RETURN WOK OR KADAI TO MEDIUM FLAME. ADD 1 TABLESPOON SESAME OIL AND SAUTE CHICKEN, PRAWNS OR TOFU UNTIL COOKED THROUGH. RESERVE. 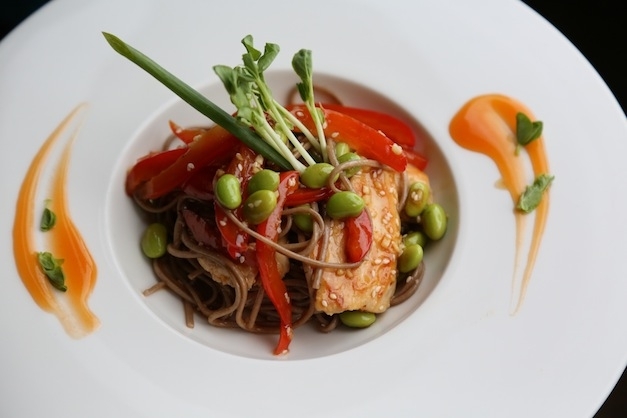 DIVIDE SOBA INTO FOUR PORTIONS AND GARNISH EVERY PLATE WITH COOKED CHICKEN, PRAWNS OR TOFU, PURPLE CABBAGE AND SPICY BASIL.